Practice good sleep hygiene – The best way to prevent insomnia is to develop good sleep habits! This includes being consistent about your sleep patterns and creating a space that’s optimal for rest. As far as consistency, it’s important to train yourself and your sleep cycle with healthy habits. Try to go to bed and wake up at the same time each day, even on the weekends. Your room should be dark and cool to support your sleep cycle. The sleep cycle is controlled by a circadian rhythm that tells your body when it’s time to be awake (when it’s light out) and when it’s time for bed (when it’s dark out). Light can throw off your circadian rhythm, so do your best to limit any light sources in your bedroom. Additionally, studies suggest setting your thermostat between 60°F and 67°F as cool temperatures can initiate the cool-down process needed for sleep. Say no to screen time – Ditch all electronics before you go to bed. While many of us decompress after a long day by scrolling through our social media feeds or catching up on our favorite TV shows, the blue light emitted from our phones, televisions, computers, and other devices disrupts the body’s circadian rhythm, negatively impacting sleep. In fact, according to Harvard University neuroscientist Anne-Marie Chang, light is the most powerful trigger for altering the phase or time of our circadian clock and can suppress melatonin, which can throw off when you feel sleepy. A Harvard Medical School study showed that people who use blue light–emitting e-readers before bed took longer to fall asleep, experienced less REM sleep, took longer to wake up, and were sleepier upon waking. 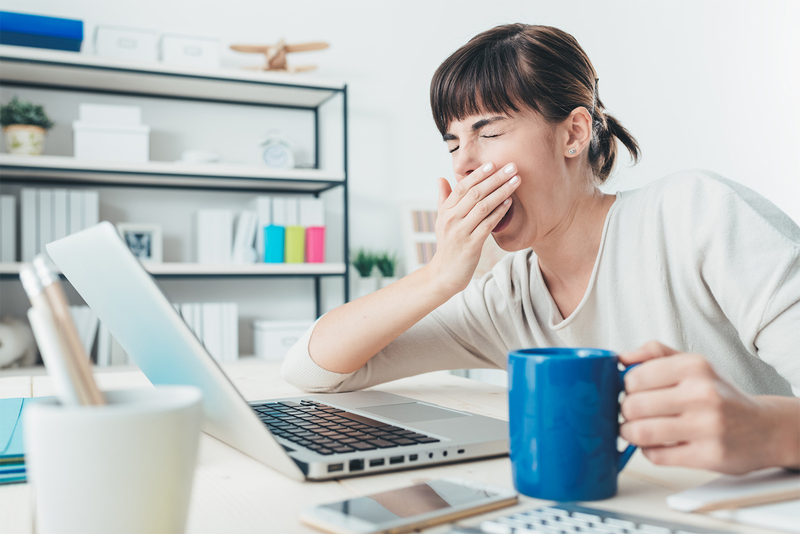 Maintain a regular workout schedule – Your sleep is greatly impacted by what you do during the day, and establishing a consistent workout schedule can lead to a better night’s sleep. In general, exercise normalizes your circadian rhythm and can also physically exhaust you. It’s important to figure out what works best for you. Just like with food, bio-individuality applies to exercise, and what works for one person doesn’t always work for another. Experiment with morning and evening workouts to see which fits your lifestyle and sleep habits best, but make sure not to exert too much energy close to bedtime. Practice self-care – Create a nighttime routine that allows you to care for yourself and wind down at the end of each day. An evening routine can lead to a better night’s sleep, an easier wake up, and a more productive tomorrow! Try taking a hot bath, setting aside ten minutes to journal, enjoying a cup of (caffeine-free) tea, reading a book, or practicing meditation or yoga. These activities allow you to clear your mind, release stress, and manage anxiety.